Indian Prime Minister Manmohan Singh’s interactions with Russian and Chinese leaders have opened up the enticing possibility of a brand new Eurasian alliance that could change the map of international relations. It didn’t matter whether Singh was merely being polite or if he really had no idea what he was talking about. What mattered was the Prime Minister displayed poor judgement by showing the Americans his cards. But in Beijing, Singh’s words elicited what is perhaps the most significant statement ever on India from the inscrutable Chinese. India-China, said Chinese Premier Li Keqiang, is the “most important bilateral friendship in the world”. That’s not a mere statement – that’s a tectonic shift. In fact, a hint that Beijing’s attitude towards India was softening was evident in a path breaking editorial in China Daily last year: “The boundary question is just a tiny part of China-India relations." The newspaper, which reflects official policy in China, went on to say the two countries are "cooperative partners, not competitive rivals, as they have far more common ground than differences”. The two countries also signed a border agreement which the Chinese side described as a "landmark" legal document to regulate the behaviour of troops on both sides. The Prime Ministers of India and Russia both arriving in Beijing on the same day had political strategists wondering if Chinese President Xi Jinping is trying to develop a new alliance. 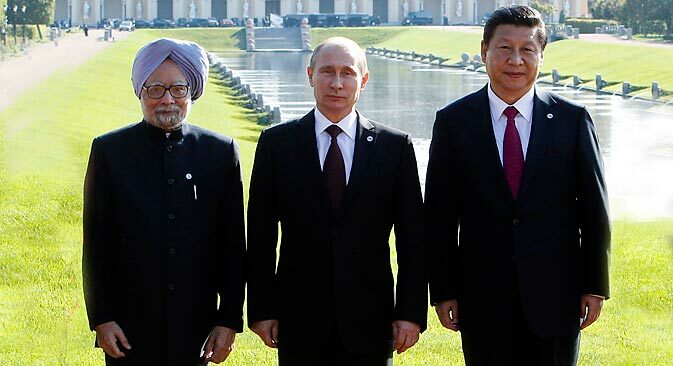 China has its reasons to seek comfort in the company of India and Russia. Despite its spectacular economic growth and high octane military spending, the Asian giant is feeling the pressure of the West’s containment strategy. America’s pivot to Asia has seen entire US Navy fleets – that once patrolled the Atlantic and Indian Oceans –steaming into the Pacific. The huge US Marines presence in Darwin, Australia, is specifically targeted at Beijing. The Chinese leadership is therefore keen to neutralise American designs to bottle up their ambitions in the Asia-Pacific. Beijing realises no matter how powerful it becomes, on its own it cannot take on the combined might of the United States, India and Japan, with Taiwan, ASEAN and Australia providing key support. Only by allying themselves with India and Russia, the clever Hans believe, can they checkmate American efforts to acquire a dominant position in the region. Well, Henry your time's up. India would hardly be pleased to play the role of America's sheriff in South Asia. That would be demeaning to a country like India, which expects to be a heavy hitter in the decades ahead. Most Indians believe they are destined to be a great power even as the West shrinks back to isolated pockets in North America and Europe. The decline of the American economy – which seems overly dependent on wars – has been a rude wakeup call to the World Bank clique that operates in India’s Finance Ministry. If the American model of growth can no longer feed Americans, how can it work for less wealthier countries such as India? While the Western democratic traditions have not benefitted much of the planet, the rival model of authoritarian prosperity espoused by Russia and China has yielded dramatic results. Much of the big-ticket economic activity now originates in Asia. The big news from Beijing this week was the signing of an $85 billion oil deal between Russia and China. More mega deals will follow as Russia lays out transcontinental pipelines to feed the ravenous economies of the East. A major spinoff of a China-Russia-India alliance is it will breathe life into the largely dormant Shanghai Cooperation Organisation. While BRICS is an economic grouping, the SCO has the potential to be a NATO-like military alliance that could ward off Western or Islamic adventurism in Eurasia. The Western media rarely fails to highlight the disparate nature of the BRICS members, especially the India-China border flashpoint. At the same time, the SCO is mocked as the Dictator’s Club. Much to the West’s chagrin, that’s going to change as India’s entry smoothens out the SCO’s non-democratic image. Also, a militarised SCO could eliminate the possibility of an India-China – and perhaps even India-Pakistan – military conflict. Not everyone is convinced a triple alliance will happen. Zhou Fangyin, a global strategist at the Chinese Academy of Social Sciences, told Duowei News, that the chances of a China-Russia-India alliance are close to zero. The timing for China to form alliances is not yet right, Zhou said, adding that the areas of cooperation right now are extremely limited. Another obstacle is China’s troublesome but “all-weather” friend Pakistan. Beijing signed a friendship treaty with Islamabad in 2005, so any alliance with India would have to wait until the treaty expires in 2015. At any rate, Pakistan has been more of a bargaining chip to be used against India and the United States. But these are small irritants. The bigger picture is India and China are not natural enemies, and with Beijing having dumped communism back in the 1970s, there is no ideological rivalry either. If India can come to terms with the fact that it is attached to a line scrawled across the Himalayas by the British colonialists -- who were intent on destroying the civilisations on either side of it -- total peace can come to the Himalayas. In 2007 economist Angus Maddison had made one of the most astonishing revelations of the 20th century with his OECD funded study on the world economy. He said that in the year 1001 CE, India was the richest country on earth, accounting for a full third of the global GDP, followed by China and the Roman Empire. After the Islamic onslaughts, India yielded the top spot to China in the 1700s, with the two having a combined 50 per cent share of the global economy. By the 1900s after the European colonial powers had stripped both countries of their wealth and industry, China and India were down to around 3 and 1 per cent respectively. The tide is now turning. Financial power, manufacturing might and military prowess are all moving East. An India-China entente would be keeping in step with this historic rightsizing. Adding Russia to the mix just speeds up that process.